Gender performance is not a uniquely American experience, although it has certainly entered into the mainstream of American popular culture within the past several years. Drag and gender performance are instead global phenomena, which occur across the globe in a variety of different forms. 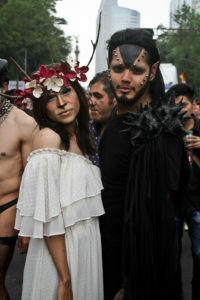 These pictures were taken at the annual LGBTTTI Pride Parade in Distrito Federal, Mexico, known to Americans as Mexico City, on June 26, 2016. These photos show the varied forms which gender performance can take in Mexico, highlighting both the similarities and differences between Mexican and American styles of gender performance. These photos also highlight the varied subjects that are interrogated through gender performance–from gender, to species, to culture, to indigenous versus colonizer narratives, and everything in between. All photos by Guillermo Angulo, Distrito Federal, 26 June 2016. Guillermo maybe coming to NYC. He is looking for folks who want to talk about photography. 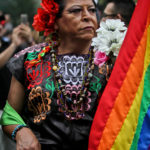 Drag and gender performance in Mexico cover just as varied themes as they do in the States, while reflecting a different set of cultural values.